In order to succeed on any level of athletics, it is imperative for teams to find impact players. Whether it be baseball, basketball or soccer, good players are needed to push the team forward. Below are some of those potential impact players. Palacois, in her first year at Georgia State University, had arguably the best season of any female golfer. She was tied for first on the team for best average round, had the lowest round of any person on the team, and was second on the team for the best finish on the team. Madewell, in the first season of Sand Volleyball play at Georgia State University, made it to the semi-finals of the AVCA National Championships. She, along with her recently graduated partner Lane Carico, lost to USC in that match to end their season. Young was one of the leaders of the team this year, ranking in the top three on the teams in goals, assists, and points. The team overall had a down year, though Young along with a deeper team than last year should improve their record. Named to the Athletic Director’s Honor Roll for the fall semester. Alford was named to both the NFCA All-Region second team and the All-CAA second team for the second consecutive seasons. Lead the team in several statistical categories, compiling a team-high 35 games in a row of reaching base. Alford was named to the Dean’s List for the spring semester. Tere-Apisah had a strong individual season, making it to the NCAA Singles Championship as well as the NCAA Doubles Championship (along with Masa Grgan). She finished first in overall record, first in record versus national opponents, and first on the team in doubles when paired with teammate Masa Grgan. Moore had strong indoor track season, competing primarily in the 60m, the 60m hurdles, and the 4x400m relay. At the Sun Belt Championship, she finished fifth in the 55m with a time of 7.14. She was also a member of the 4x400m relay team that placed sixth at the Sun Belt Championship. Bohannon had one of the stronger performances on the volleyball team this year as they struggled through a poor season. 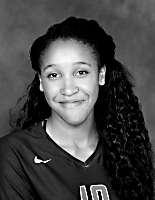 Bohannon played in twenty three of a possible twenty four matches for the Panther’s volleyball team, ranking 3rd on the team in overall points scored with 200. Magnificent items from you, man. I have have in mind your stuff prior to and you’re simply extremely wonderful. I actually like what you have received right here, really like what you’re stating and the way in which wherein you are saying it. You make it enjoyable and you continue to care for to stay it smart. I can’t wait to learn much more from you. That is really a terrific site.